Apr. 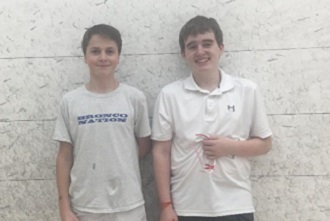 10, 2019: This past weekend, nine Bronxville junior squash players participated in the U.S. 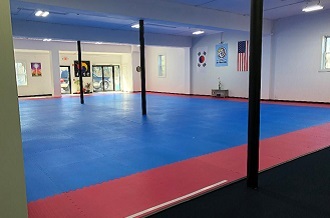 Junior Silver Squash Championship, which was held at Chelsea Piers in Stamford, Connecticut, and MSQUASH Accelerator in Portchester, New York. These players were Pippa Fraser (Girls Under 19), Ellie Clifford, Claudia El-Masry, and Katie Hennessy (Girls Under 15), Charlie Clifford, Ronin Kaplan, Ben Korengold, and Rustin Wiser (Boys Under 15), and James Murphy (Boys Under 13). James Murphy turned in a tremendous performance, winning the Boys Under 13 Division. James came into the tournament as the #3 seed and upset the #2 seed in a hard-fought five-game match in the semifinals. He then prevailed in another five-game match in the finals against Charlie Mullin of Cincinnati, Ohio, to win the tournament. Ronin Kaplan also had an amazing performance, placing second in the Boys Under 15 Division. Ronin entered the tournament as the #7 seed and fought off two match points in his semifinals match against #3 seed Evan Wen of Short Hills, New Jersey, to prevail 15-13 in the fifth game and advance to the finals, where he finished second. Pippa Fraser finished #4 in the Girls under 19 Division. This is particularly impressive given that Fraser came in unseeded and took out the #6 and #3 seeds in three games before falling to the #2 seed in the semifinals and ultimately taking fourth place. Rustin Wiser finished 7/8 in the Boys under 15 Division and Ellie Clifford finished #9 in the Girls under 15 Division. Katie Hennessy finished in the Top 16 of the Girls under 15 Division, as did Charlie Clifford in the Boys under 15 Division. Claudia El-Masry finished in the Top 25 of the Girls Under 15 Division. 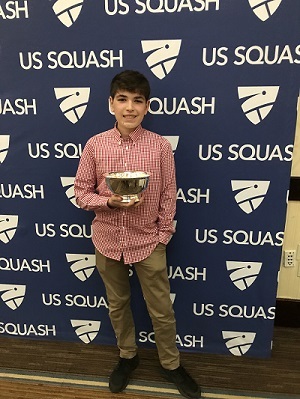 Ben Korengold took home the “most improved honorable mention” award in the Boys Under 15 division for improving his ranking by over 85 places over the course of the squash season. Pictured here (in descending order): Top (rotating): James Murphy and Ronin Kaplan; second (rotating): Ellie Clifford (L) and Claudia El-Masry, Katie Hennessy; third: Charlie Clifford (L) and Rustin Wiser; fourth: Ben Korengold.